Law enforcement careers are often heralded for their many intangible benefits, from helping others to serving communities. These are great ideals, but what about the practical benefits of a law enforcement career? Government jobs are often best known for their generous health benefits, even if salaries aren't always equal to equivalent private sector jobs. This most often means affordable health insurance for police officers and their families. In law enforcement careers, though, another and often even bigger benefit comes at the end of your career, in retirement. Due to the stresses and rigors of the job, police officers are often afforded the opportunity to retire earlier than most, at either 20 or 25 years of service, and at a higher accrual rate than most careers offer. This translates to better benefits, sooner. While it's true that you'll probably never hear a police officer tell you they think they get paid enough for what they do, the fact is that most departments offer fairly competitive salaries. 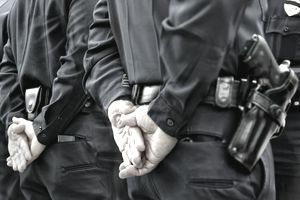 Law enforcement officers will typically start out making between $30,000 and $45,000 per year, with many agencies offering additives for differing shifts, length of service, and additional training or expertise. It is possible, depending on your department, to finish out your career earning $75,000 or more. If you choose to promote, you can earn even more. The chain of command structure in law enforcement organizations provides for tremendous opportunities to promote and advance through the ranks. Rank structures in law enforcement agencies often resemble those of the armed forces. As positions become available, they are typically filled from the lower ranks. While agencies may sometimes promote someone from outside the department, more often than not there is an objective promotional process for rank and file officers. Larger police agencies will usually make several promotions throughout the year, meaning there is often ample opportunity for motivated individuals to advance their careers. The learning never stops in law enforcement. Because you'll be working in a diverse and dynamic environment, you'll necessarily be learning new tactics and techniques throughout your career. Besides the mandatory retraining that most POST and standards and training commissions impose on officers, training opportunities exist for an almost immeasurable number of topics that can help you excel in your career. Topics include languages, advanced defensive tactics, physical fitness and beyond. Virtually any training that you can think of that can aid your career is often made available at no cost to the individual officer. It's not a secret law enforcement officers like to reveal too often, but the truth of the matter is, the job is fun. While working as a police officer, it's not uncommon to hear someone utter the phrase "I can't believe I'm getting paid to do this!" Sometimes, you may have to drive fast. Sometimes, you may have to chase people on foot. Working crime scenes, guarding perimeters, tracking suspects and the like can be so interesting and intriguing that often doesn't feel like work. Moreover, many police activities necessarily bring an adrenaline rush that can keep you excited and enthusiastic about the job far after the incident itself wanes. It is not to say that professionalism goes out the window, but rather personal enjoyment from a job done both safely and well, with a positive outcome, is a well-deserved and welcomed side benefit of an already rewarding law enforcement career. A decent salary, great benefits, constant opportunities to learn new things, and ongoing chances for advancement. What more could you want in a career? It's true that working in law enforcement can be hard, and there are many difficult and trying days on the job. At the same time, though, a career as a police officer offers opportunities and benefits not found in almost any other job.